Indonesia's Mount Sinabung in north Sumatra province erupted seven times in the space of a day. 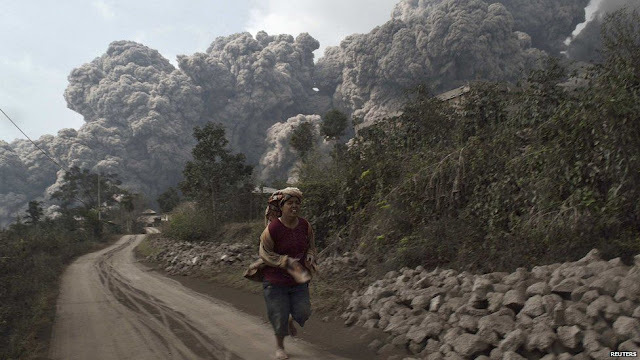 "The eruptions occurred from midnight until 4:50 pm on Sunday," volcanology agency official Arif Cahyo said. The ash from the volcano was carried by winds to Berastagi, a tourist town in the Karo highlands south-east of the volcano. Local officials in Berastagi told locals and tourists to wear masks and eye protectors to avoid being exposed directly to the volcanic ash. The volcanic activity put the surrounding area on the highest level of alert. Areas within a radius of seven kilometres were closed to villagers, while thousands were displaced by the activity and are still living in temporary shelters. Martinus Sitepu, head of Karo district disaster mitigation agency, said the volcano ejected material up to 5,000 metres into the air. Mount Sinabung has been erupting periodically since September 2013. ALL of Indonesia will implode soon, the entire island nation is ONE BIG CALDERA.